Contrary to popular belief, captivity is actually killing elephants, not helping them. According to recent articles in the Seattle Times, most of the elephants who died in U.S. zoos suffered from diseases related to captivity. For every elephant born in a U.S. zoo, on average two others die, a Seattle Times analysis found. In addition, IDA gives the Lowry Park Zoo (Florida) a dishonorable mention, while the Topeka Zoo (Kansas) becomes the newest inductee into the Worst Zoos for Elephants Hall of Shame, a special honor reserved for the worst repeat offenders. 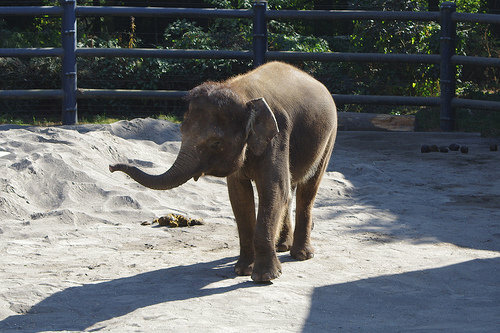 IDA looks at a number of factors for determining which zoos make the Top Ten Worst Zoos for Elephants including health problems, lack of space, cold climates, unnatural behaviors, social issues between elephants, solitary elephants, breeding issues, premature deaths, and management style. “Scientific research shows what elephants need in order to thrive: space to walk miles every day, family social structures, and a rich natural environment,” said Nicole Meyer, Director of IDA’s Elephant Protection Campaign. This is something that these zoos simply cannot, or will not, provide. According to IDA and the Seattle Times, elephants in captivity frequently suffer from a dramatically shortened lifespan, arthritis and foot disease, psychological deterioration, and high infant mortality rates. Find out what you can do to help these magnificent animals here.